Edward George Newman was born at 5 Thong Lane, Ightham in early 1891 and christened in the local parish church on 22 February. He was the son of Edward Newman, a paper glazer from Wrotham, and his wife Harriett Wells. By 1901 the family lived in the cottages at the top of Basted Lane, with Edward and his sisters attending school, probably in Ightham. Based on his service number it seems likely that Edward enlisted in Maidstone around May 1910 when he joined the Royal Field Artillery although at the time war broke out in August 1914 he was living at 1 Whatcote Cottages and in the Army Reserve. 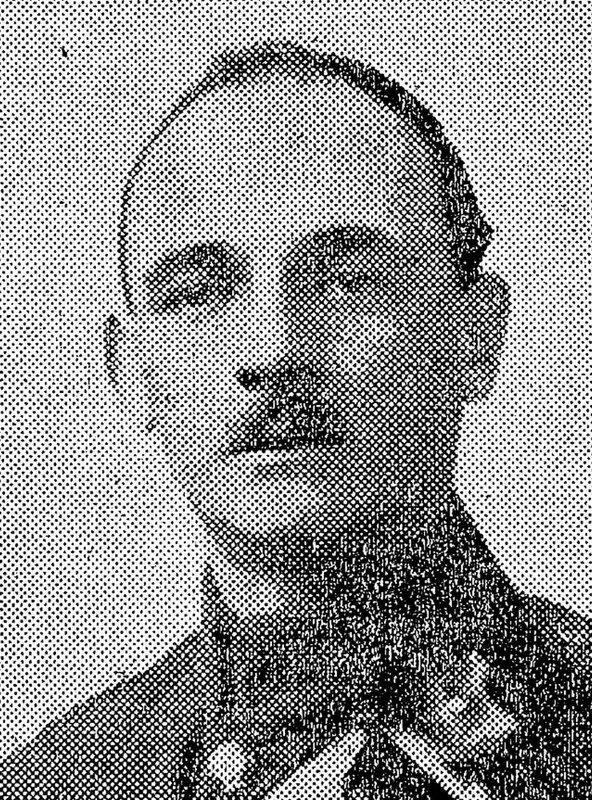 Gunner Newman mobilised for service on 5 August and collected a travel pass to join the 8th Howitzer Brigade, RFA in Ireland. The 8th had been composed of the 37th, 61st and 65th Batteries and formed part of the 5th Divisional Artillery. Edward was assigned to the 65th Battery and left Dublin for France on 18 August on board the SS Oxonian – arriving in Le Havre the following day. Two days later he reached Landrecies and marched to Bavay which is southeast of Mons. The brigade took part in the Battle of Le Cateau on 26 August before retreating to the Marne and subsequently coming into action at the Aisne, where the Allies and Germans reached stalemate and trench warfare began in earnest. October: 2nd. A thick fog all day. Did not fire F.G.C.M. (Field General Court Martial) in the afternoon. Moved to Nampteuil in the evening. A bad billet. Horses again in the wood, men in a dirt barn, selves (the officers) in a dirty cottage. Out of enemy’s range first time since September 12th. 3rd. Remained hidden all day, moved at 7 p.m. to Longpont, arrived at midnight. Horses and vehicles in a wood, selves under a chestnut tree in the park. Quite comfortable and warm. Fine but misty. 4th. Hidden all day. Went to church in the morning. Service in a fine ruined church beside the chateau. The church was destroyed during the Revolution and must have been very fine building, about 180 yards long. Inspected the chateau. M. le Conte is still there. The Germans did practically no harm, only looted the cellar, regardless of the owner’s protests. It is said that the Kaiser’s brother once stayed there and he ordered that on no account were such sacred places to be injured. A fine house with ornate furniture. Marched at 7:30 p.m.
5th. A horrible night. Did not reach our billet at Pontdron until 5 a.m. Delayed for hours by infantry of a French Corps who were being moved on hundreds of motor lorries and buses. They streamed past us for ours. One long delay as a bus caught fire and we could not pass until the fire had burnt out. 7th. Marched at 6:30 a.m. Bitterly cold. To Compeigne, about 13 miles, independently. A comfortable march through the Forest of Compeigne, a beautiful forest, splendid trees, all turning……Handed over 13 sick and lame horses to French authorities. 8th. Bitterly cold journey. Arrived at Noyelle (35 miles from England) at 3:30 a.m.
9th ….a long cold march to Trois Viaux (25 miles), near St. Pol. The infantry were taken by motor vans. Guns and transport marched…..thousands of refugees from Lille moving south all day. 11th. Moved at 6 a.m. to a village about 2 miles from Béthune. Heard some firing on our right, and French Cavalry were engaged on our front at Locon Reconnoitred a position to cover the canal in case we were attacked on that line. 12th. Marched at 7:15 a.m. Thick fog, did not clear until 10:30 a.m. Our advanced guard is at present engaged east of Locon. The French Cavalry are withdrawing and we are taking their place. This is a nasty, flat country. Germans are shooting on our left and some of our guns are in action on our right. We can see nothing. The French Cavalry are withdrawing, they look very quaint in their many-coloured kit……got into action about 2 p.m. near Rue l’Epinette firing towards Richbourg l’Avoue…..
13th. Up at 3:30 a.m., in action in same place at 5 a.m. Fired a few shots, but there is no opposition here. Was moved at midday to our right flank against Hecker, near Annequin. Considerable fighting going on. Am to support the French in an attack on Vermilles. An awful din, 7 batteries are firing over my head, 3 18 pdrs, 1 heavy, 2 French and my own. Am observing from a horrible slag heap, so am filthy. 15th. We have been lent to the French for the day….saw a lot of Germans on the west of Vermilles, the Commandant said they were French, but at last he allowed me to shoot, got well amongst a lot of Germans whom we bolted from some stacks. A gun from their trenches opened fire, but we silenced it after it had fired one round, their teams then bolted, and we got at them. Six French batteries then chipped in, and that neighbourhood became most unhealthy, one could see nothing for smoke, dust and flames…..
17th. Battery in position south of Pont Fixe….enfiladed a trench in front of some railway trucks, making it impossible for them to fire, get a good many lydite into the trench. Many dead of both sides all around the village. 18th. …..French delivered a very gallant attack in the afternoon, lost a good many men, but got on well. Another counter-attack in the evening, very heavy rifle fire most unpleasant, and bits of shell through our roof. 23rd…hunted about and broke open the door of a school, got into loft under the tiles, cutr some loopholes. Saw little of the Germans in the morning, but they shelled us heavily. Knocked the houses about all round our station, and put bits into our house, so I went to see if the brewery was tenable. Found it very much knocked about and every one cleared out. Very unhealthy. Had a lot of shooting about La Quinque Rue, was hit in the head about 5 p.m..
Two days after the final diary entry for October was written, Edward was sent to No.15 Field Ambulance in Béthune suffering from boils. He was eventually transferred back to England and admitted to St. Mary’s Hospital in Wandsworth on 26 November. The cause of Edward’s affliction is not known, however, with the high protein Army diet, boils were a common occurrence with men complaining of being ‘bunged up.’ Boils could also appear after being bitten by lice, which thrived on the bodies of men serving in the trenches. After he had recovered, Edward was transferred into the 94th Brigade, Royal Field Artillery, joining them at Aston Clinton in Buckinghamshire between May and September 1915. The brigade formed part of the 21st Division and primarily manned by regular soldiers and recalled reservists. It eventually left Southampton for Le Havre on 8 September and within three weeks Edward, who was in ‘B’ Battery, went into action at Loos. At the battle, the four batteries were positioned in the open behind the advancing infantry and expended 438 rounds, but had eight guns hit and temporarily taken out of action. In addition to 11 dead horses, the human cost numbered three killed, 13 wounded and two gassed. Sir, – Being a resident of Borough Green for many years, I wish through your well-known paper to thank Nobby Barnes for the good work he has done for the lads of Borough Green and Platt. I have received the “Kent Messenger” from my parents weekly, and one or two of my chums, being also natives of Kent, are likewise very pleased to be able to read the news of our dear old district. Attractive and well-built dug-out, containing one reception, kitchen, bedroom and up-to-date funk-hole, 4ft. by 3ft. All modern inconveniences, including gas and water. Particulars of late tenant, Base Hospital. P.S. I am pleased to see how the young men at home are enlisting to help their comrades in this terrible struggle for victory, which we must have and avenge poor Belgium. (Sung and composed by the boys of “B” Sub- Section, Gun Detachment, D/94th Battery, R.F.A., 21st Division, B.E.F.). We sent some old scrap iron to old Fritz, the other day. Told him that we were sorry, but it had to go his way. And we’ll mix the dose again, any time. And when we get him, on the run, our first stop is the Rhine. If then lie does not pack up, he will find it is too late. For we’ll strafe his bally country, and there he’ll meet, his fate. When they are marching to Berlin. For the dirty work he’s done. On 23 March 1916, the 94th Brigade left Armentières for Caëstre, where they entrained for the Somme – arriving at Daours on 1 April. From there Edward’s battery took up a position south of Albert at Méaulte. At 3:30 am on 24 June the brigade took part in the preliminary bombardment for the Battle of the Somme, which began a week later on 1 July. On the day of the infantry attack, Edward’s battery fired from a position southeast of Albert at Bécordel in support of the 50th, 63rd and 64th Infantry Brigades, who were advancing on Fricourt. Over the next three weeks, all batteries provide artillery cover for several further assaults, including attacks on Bazentin le Petit Wood and Delville Wood. Brigade casualties during this period consist almost entirely of men who were wounded; however, the War Diary also mentions gunners suffering from ‘shell shock’, which is unsurprising given the considerable amount of ordnance being sent back and forth between the two opposing armies. Here in a wilderness of mud, holding water logged trenches or a shell hole post, accessible only by night, the infantry abode in conditions which might be likened to those of earthworms rather than of human kind. Our vocabulary is not adapted to describe such an existence because it is outside the experience for which words are normally required. Mud, for the men in the line, was no mere inorganic nuisance and obstacle. It took on an aggressive, wolf‐like guise, and like a wolf could pull down and swallow the lonely wanderer in the darkness. Unknown to the Allies, during the previous summer, the Germans had begun constructing a robust new defensive system several miles behind their front lines. In February 1917 they started pulling back towards it in a withdrawal known as Operation Alberich. Having been somewhat taken by surprise, the British cautiously moved forward towards this new front line, with the 21st Division taking part in the advance. The 94th were to play their role during March, when they attacked southeast of Arras at the Croisilles-Hénin Road, before moving forward towards the Hindenberg Line itself at the end of the month. The stronghold held for another 18 months before the Allied forces were able to break through in September 1918. Following the ‘advance’ Edward’s battery was brought into action several more times during 1917, firstly at Arras and then Passchendaele, and by the start of September found themselves based east of Ypres at Reninghelst. On the 17th, during a particularly ferocious enemy artillery barrage, Edward was wounded above the knee while trying to extinguish a fire that had broken out in his gun pit. He was evacuated from the battlefield and taken to the 140th Field Ambulance before being sent to a hospital in Etaples where he died on 5 October during an operation to amputate his leg. 61654 Sjt. E. G. Newman, R.F.A. (Borough Green, Kent) (LG 17 Apr. 1918). For conspicuous gallantry and devotion to duty. He has been in command of his sub-section for over two-years, and has done consistently good work. His good example under the most trying circumstances has been invaluable to the other ranks of the battery. During the recent operations he was wounded while trying to extinguish a fire in his gun-pit under heavy fire. Sergt. E. G. Newman (Platt), R.F.A. Mr. and Mrs. E. Newman, of Whatcote, Platt, near Wrotham, have to mourn the loss of their only son, Sergy. E. G. Newman, who died on October 5th in France, being too seriously wounded to be brought to England. He was wounded on the 17th September 1917, and died in hospital after unfergoing an operation for amputation of the leg. He never regained consciousness, but passed peacefully away at the age of 26, and was buried in Etaples Cemetery. Always a dutiful son and affectionate brother, Sergt. Newman was also an upright soldier, as is proved by the rank he attained, and by letters from his friends in his regiment, in which he was very popular. His death is therefore greatly mourned.